Where Dragonwoofs Sleep and the Fading Creeps will captivate young audiences with its unique blend of contemporary thrills and fantasy adventure. Blurring the lines between fantasy and reality, A.J. 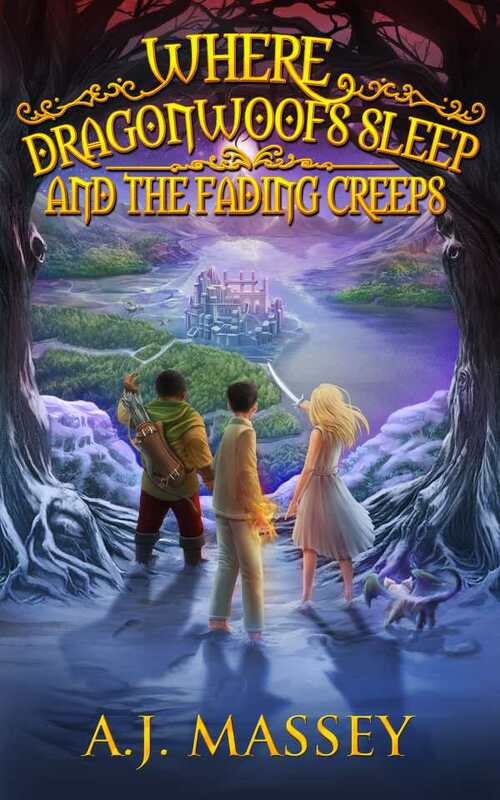 Massey’s Where Dragonwoofs Sleep and the Fading Creeps is a mind-bending fantasy adventure for upper elementary and middle grade readers. When thirteen-year-old Ben suddenly awakens in a treacherous winterland, he throws his lot in with two elves and a human boy and girl, Marcus and Avery, who are all intent on saving the land of Meridia from mysteriously disappearing. A world away, Ben, Marcus, and Avery battle bullies, first crushes, and junior high classwork. With one foot in each realm and no memories to guide them, the three face unrelenting challenges as they navigate their waking and sleeping perils. Ben’s adventures in Meridia take on a dreamlike quality, complete with humorously muddled dialogue with the natives and a fixation on watches and timepieces. Colorful characters appear, like a goblin general, wind-up innkeeper, and a cadre of glass automatons, but the action is centered around the three humans—or “weeds,” as they are known—who continuously find themselves in entertaining albeit unbelievable situations with equally entertaining and unbelievable outcomes. Younger audiences may enjoy the mix of humor, suspense, and juvenile decision making: swallowing a mouthful of cough syrup to immediately fall to the ground in a deep sleep, or setting off on a dangerous quest to retrieve the head of a sphinx because a doorman said so. But there are some inconsistencies that will be problematic for those that revel in the details. For example, in Meridia snow is warm, snowflakes are “flaming hot,” but ice is cold. The parallel worlds mix in surprising ways, keeping the suspense humming. Ben, Avery, and Marcus gain a degree of confidence in themselves as they solve riddles, fight monsters, and, in Avery’s case, get a makeover. Many questions remain unanswered, though two epilogues (one for each world) hint at a possible sequel.